If you’re planning a party this year and haven’t yet figured out the theme, keep reading. Here at Solid State UK, we’ve been helping individuals create their perfect celebration for many years. For our latest post, we’ve put together a list of the top trends that are set to be seen throughout 2019. The Pantone colour of the year is “living coral”, a vibrant colour that would look perfect throughout accents at a party venue and in dress codes, especially throughout the summer months. This colour is playful without being over the top. It gives a sense of glamour whilst maintaining elegance, which is why it is the perfect choice for various celebrations, from weddings to christenings and birthday parties – whether its 5th or 50th. So we’ve had giant cookies and chocolate towers taking the place of traditional cakes, but this year is all about personalisation, with food in the shape of lettering coming into trend. Perhaps taking inspiration from the popular giant light up letters which became increasingly popular throughout 2018, this year is the time to get truly creative when it comes to food table centrepieces. Whilst still popular, traditionally shaped confetti balloons are moving out of the spotlight in order to make way for orb balloons. 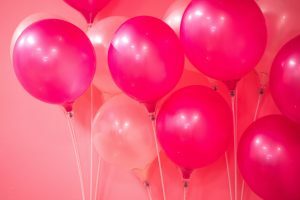 Whether you choose the use these giant balloons throughout your venue or in one area as a decorative group, they sure make for a playful design touch. Unlike traditional balloons, orb balloons are completely spherical and able to blown up much larger than a traditional party balloon. What’s more, you can find these decorative accessories in a wide range of finishes including reflective metallic. Our specialist events team take great pride in all of the events we bring to life. From furniture hire to decor and accessories, we’ll ensure that all aspects run smoothly so you can relax and enjoy the celebration. For more information on our wide range of event and furniture hire services, please call us today on 0116 2885956 or send your enquiry through to our contact form and we’ll be in touch shortly.